Static electrification (SE) in transformers is an interfacial phenomenon, which involves oil, paper and transformer board. Its physical mechanism involves a source of charge and region of excessive charge accumulation. Extensive investigations about this phenomena have been made during recent years. 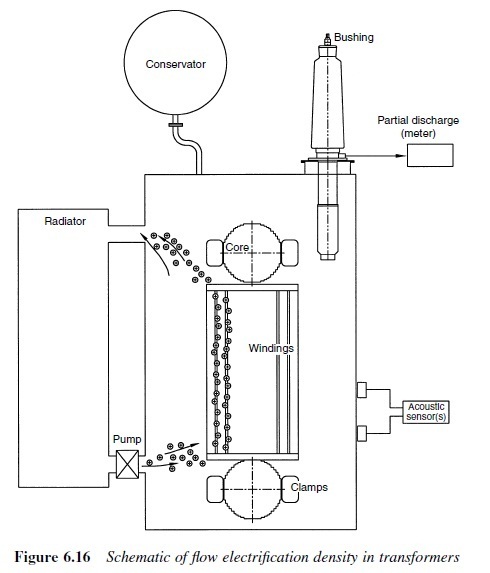 25 When oil is forced through the tank and coolers, it acquires an electrostatic charge, i.e. it contains an equal number of positive and negative ions. 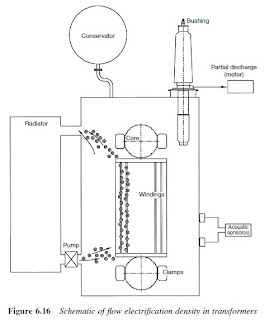 When the oil passes the paper and solid insulation in the windings, the insulation becomes negatively charged and the oil positively charged with the charge separation occurring at the oil-insulated interface (Fig. 6.16). The earliest reports on this phenomenon were in the 1970s from Japan, where number of h.v. large transformer failures occurred. And later quite a few SE-related incidents were also reported in the USA and other countries. It is believed that transformers of large rating (e.g. >100MVA) are most likely affected by SE because they possess greater amounts of insulation and require larger oil flow volumes than transformers of smaller ratings. As different oils have different electrostatic charging tendencies (ECT), oil additives might be a way to reduce oil ECT. As an alternative to the additive, used oil can be regenerated because new oil exhibits a lower ECT than aged oil. On the other hand, operation practices are also of great importance. SE incidents can be caused by poor operating practices such as increasing forced oil cooling capacity beyond manufacturer’s recommendations, or having more forced oil cooling in operation than the load on the transformer justifies.